Saludos todos! 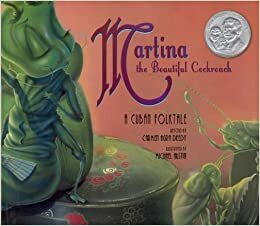 This week we are concluding our monthly theme of love with Martina the Beautiful Cockroach, an adaptation of an old Cuban folktale, written by Carmen Agra Deedy and illustrated by Michael Austin. This book won recognition as a Pura Belpré Honor Book. According to the introduction of the book, this folktale is one of the best known in Latin America, but versions of this classic tale also exist in other regions of the world. Nonetheless, Deedy takes this traditional tale, and its familiar themes, and intertwines it with her own creative twists and childhood memories. This in itself is one of the beautiful things about traditional folktales—their themes and plots have become so familiar to most people that they can be retold and adapted across countries, cultures and individual experiences to reflect both common sentiments of society, and the particular lives of individuals. Martina the Beautiful Cockroach deals primarily with themes of romantic love, but also of familial love, as young Martina relies on the advice of her wise abuela in choosing a future spouse. This charming story conveys themes of respect, compatibility, and family love, and is bound to make any reader smile as they follow the journey of Martina the beautiful cockroach.